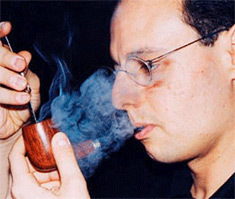 Up Down Cigar has the largest online selection of exquisite handmade briar pipes in the world. Our vast selection includes pipes from esteemed, world famous manufacturers like Dunhill, Ashton, Castello, Peterson, Radice and Ser Jacopo just to name a few. Every pipe we sell is personally hand picked by Diana herself to ensure that only those pipes with the finest grain, finish and proportion reach our shelves. Our knowledgeable staff is always available to answer your questions concerning caring for and enjoying your pipe. In addition to our vast selection of briar pipes, we also carry authentic Native American Peace Pipes, Turkish Meerschaums and a wide range of good looking, great working Pipe Accessories.